It was Liverpool’s first Social Media Cafe Liverpool #smcliv last night and I’d be amazed, given the way it went, if there wasn’t another one taking place very shortly. I was one of the speakers (report of the evening will be on my work blog later today) but this post is a bit different; I wanted to write some thoughts out of my head about data, and journalism, and how – for me, at least – it’s very easy to get lost in what makes a Really Awesome Visualisation, when what it should be about is information. Sometimes I need to remind myself, statistics are not the whole story. When Neil Morrin, of Defnetmedia, asked me to talk at the SMC I was a little stumped for a topic as I know a lot of the social media/tech crowd in Liverpool and many of them have far more ideas about cool online stuff. They tend to build it themselves. The idea of talking about visualisations – but with the visuals as an aid to exploring the angles of a story rather than the be-all and end-all – came about because I’d found making a couple of infographics helpful in dragging out some interesting facts behind some stats released by Knowsley council. The visuals were tools to help me see what the potential story was, not the reader – although obviously that was a spin-off. As it turned out, I think they helped me uncover a richer news story than the original data provided. The council also put up residents’ written responses, which was what I was interested; in their own words, locals were abound to be more prescriptive than they could be in a council ‘tick the box’ approach which gave them eight options. First I put all the text into Wordle.net and refined it to give me the top 50 most repeated words. That gave me an idea of the emotion of the responses, and a hint that the comments held richer pickings than the rest of the report. So I plotted a spreadsheet of what each resident raised (I kept the headers initially vague, and refined them as I went along and themes emerged) which was tedious and time-consuming in the extreme. But worth it; they differed to council responses in fairly significant areas – such as being overwhelmingly in favour of keeping the Kirkby Suite and halting planned demolition, and wanting a football stadium linked to a superstore. Neither of these issues are flagged by the council’s tick-box approach – not because Knowsley didn’t want to acknowledge them but because the suite demolition is planned, and the stadium scheme was rejected. 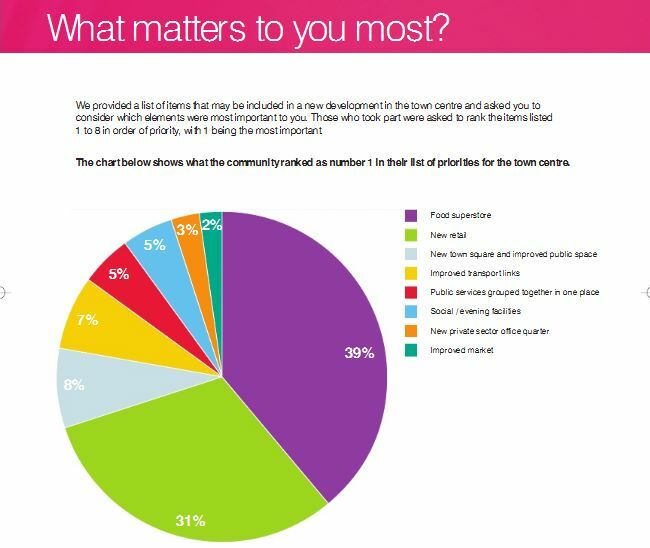 They are done and dusted in the world of local government – but not in the minds of those who responded to the survey. Policing – or the lack of – is another standout. I used Kirkby as the starting point but if you change the phrases it gives a marvellous insight into what people want. Try ‘I would like to see‘, for example, and you get everything from the specific and wistful ‘department store selling nice clothes‘ to the rather more damning ‘you tell the truth‘. I think it makes interesting reading – sure, it’s not MP expenses but I got satisfaction from digging the details out – and it was a good learning experience for me. Some of the answers don’t differ wildly but aspects – for example, the strong feelings about the need to keep the Kirkby Suite and policing – give clear pointers about local feelings. That could help really inform an editorial decision on how much space, time and effort to devote to a story – here, for example, I reckon a reporter with multimedia tools and time cleared in the diary to really spend time in Kirkby talking to people, could focus on the real needs of the area, and re-establish a bond between the paper and the area. Statistics are amazing things and make wonderful visualisations. But they aren’t the whole story. People are the whole story, and I believe these visualisations helped me find that.